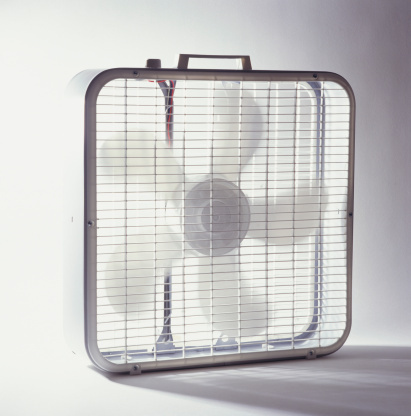 When a small space like a room or cubicle needs better air circulation, a portable fan is the way to go. Their operation keeps fresh air moving into and through a room, and in comparison to central air conditioning, they are inexpensive and better for anyone who is sensitive to cold air. Two of the most common types of portable fan are the box fan and the tower fan. A box fan is a portable fan that is placed within an enclosure, the face of which has a latticework plastic or steel grille that allows the air to move into and through the fan. The box fan can be square, oblong, rectangular or circular in shape. It can easily be moved from one room to the next. Box fans can also be placed in windows to move warm or stagnant air from the interior to the exterior. Used in this way, the box fan helps to rid the room of smoke, dust and odors. The tower fan is another kind of portable fan that has a series of small blowers set in a vertical "tower" unit, which can be placed on top of a desk or table and moved easily from one place to another. Tower fans are especially popular in Europe and Asia, where central air-conditioning units are relatively rare for ordinary households. While box fans simply move air in a straight line from back to front, tower fans can be set so that the air circulates in any direction: upward, downward and through a rotary angle of up to 180 degrees. This allows the user to heat, cool or ventilate a larger area than is possible with a stationary box fan. Tower fans can be controlled with a remote and, like most box fans, have varying speeds. If there has been a flood or leak that has created damp conditions on a floor or in a room, using a box fan can help to circulate air, dry the wet surfaces and prevent the growth of mold and mildew. The tower fan is also useful for this purpose, as it circulates air from a more varied height through and out of the room. Many tower fans come with timers which makes it easier to time when they are used and for how long. Some tower fans can also be set to "natural breeze" operation, to imitate shifting and intermittent outdoor winds. Some tower units come with ionizers, which change the chemical composition of the various atmospheric elements and create a more healthful and energizing atmosphere. Tower fans are generally quieter while operating and also are less hazardous for curious pets and kids. Though Dyson fans don't have the same structure as most traditional fans, they can be considered tower fan style and are often searchable with other tower fans online. The do not have visible blades and are also a viable option for homes with pets and children. 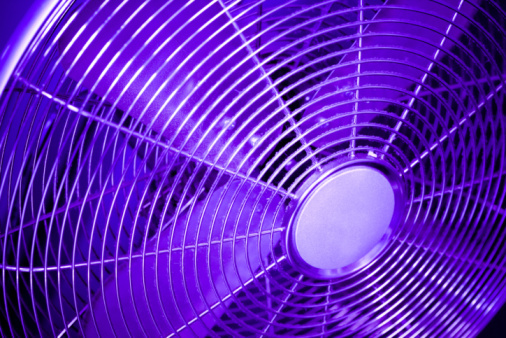 Box fans are typically less costly than tower fans, as their mechanics are relatively simple. They are easy to repair or replace, while tower fans often must be returned to the manufacturer or placed in the hands of an experienced electrician or appliance service for any necessary work. Tower fans have the advantage of taking up less floor or desk space and are easier to relocate from one position in the room to another. They're sleeker than box fans, but are unassuming and can fit in very well with all kinds of room decor, any lights, bookcases, or entertainment centers. 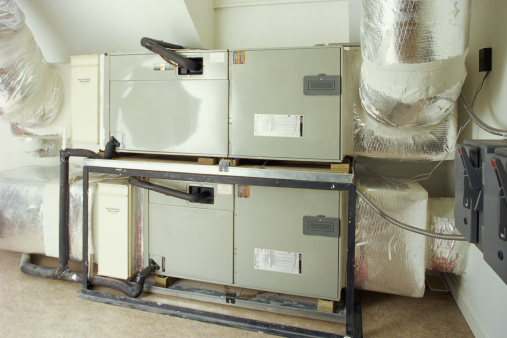 What Is an ECM Furnace? Should a Box Fan Be Facing in or out of the Window?